Bridges and crowns are dental solutions that fit on top of your gum line. If you want something that will last you the rest of your life while looking and feeling like a natural tooth, you might want to consider dental implants. Dental implants are set right into your jawbone and are suitable for patients with strong, healthy gums and teeth. Once completed they can also be used to support and connect your dentures. At Karen Dental, we can offer this service with special freezing technology to make it painless and pleasant for patients. Prior to the procedure, your dentist will examine your mouth, your medical and dental history, and take an x-ray of your jaw, mouth, and head to ensure you’re a suitable candidate for dental implants. Step 1: A titanium root is inserted into the jawbone. The gum tissue is stitched back into place and the root is allowed to bond with the jaw over several months. Step 3: A custom artificial tooth is created and securely fitted over the abutment. 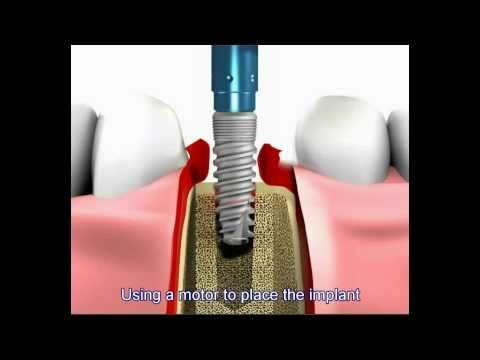 Dental implants should only be considered for appropriate candidates. In order to be a suitable candidate the jawbone accepting the titanium root needs to be strong enough to support an implant. After the procedure, the patient needs to make follow up visits and use extra oral care to ensure the success of the implant.